Frankly, I can’t figure out for the life of me why this epigraph is chosen to set the tone for this film. The only thing I can think of is that our protagonist, Nels Coxman (Liam Neeson), makes the townsfolk of Kehoe, Colorado happy when he goes, because his job is driving a snow plow that quite literally keeps the town moving. But that is not really the meaning of the quote. And the plot does not concern itself too much with the goings-on of the town and humble snow plow drivers. When we first see Coxman, we learn he is being honored as Kehoe’s “Citizen of the Year.” He is a simple man of modest means and fewer words, and the town appreciates his value nonetheless. Then his son is murdered, and his entire life rapidly falls apart. It’s a perfect setup for a comedy! And that’s what Cold Pursuit is, more or less. An action-comedy film about a man seeking vengeance (aka the Liam Neeson formula). And it plays like a film that is aware of who its leading man is. Neeson and the cast play it straight, but the script does not. This makes some of the humor effective. The scenes in which the main villain of the picture, “Viking” (Tom Bateman), tries to educate his son are genuinely inspired sketches (“It has all the answers you’ll ever need,” he instructs the child, in reference to a copy of Lord of the Flies). But when the humor blends with the violence, they do not complement each other. With a different execution, perhaps they would, and I’m not sure what that different execution would entail. And director Hans Petter Moland should be commended for not pulling his punches when it comes to the R-rated action violence, as a washed-out PG-13 version of this film would not be more effective. However, the winking comedy and the absurdly over-the-top violence do not come together to form a uniform comedy. Instead, they act to make each other look more grotesque in juxtaposition. Not to mention that this high-violence take lessens its grip on the audience as the movie progresses. What starts as Coxman, a usually non-violent man, seeking out a couple of men associated with his son’s death and killing them brutally leads to a high body count climactic sequence. With each successive vengeance set piece, the energy starts draining from the film—include in this, also, the casualties of the side plots involving Viking and a rival Native American gang. By the time we reach the climax, the desire for vengeance no longer feels like a viable motivation. It is all just a blur of people shooting each other, pawns knocking off pawns in a chess game that is more brute force than strategy. The film has an adequate pace for its two-hour runtime, but getting through the final act and its climax is a slog. 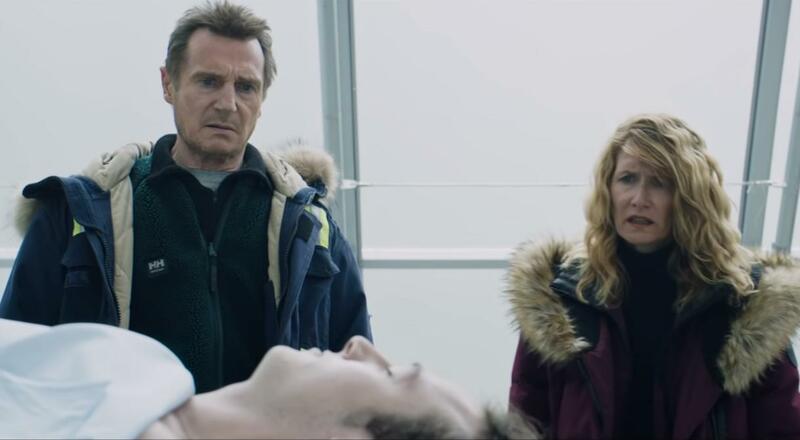 Cold Pursuit is a strange tonal experiment that plucks its frigid setting and its crime-comedy mashup straight out of Fargo but fails to thread the needle as effectively. It has its cheeky moments, but it might be winking too much to allow the actual narrative to breathe. Liam Neeson does his Liam Neeson thing—for the record, I’ve never fully understood the appeal of the subgenre that has evolved around his persona. If it’s what you’re into, then you’re in for a treat. Otherwise, perhaps think twice.